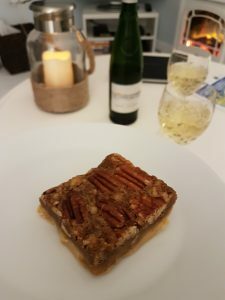 We took an impromptu trip to the New Forest in Hampshire for our first wedding anniversary and discovered some real gluten free delights along the way. 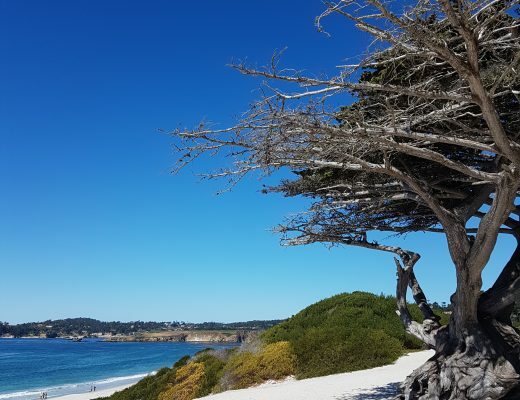 The New Forest is a beautiful part of England and its close proximity to the sea means you get the best of both world when it comes to forest walks and beach time. 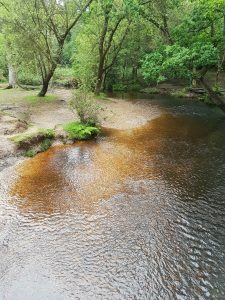 Easily reached from London, I heartily recommend it for a weekend getaway and there are plenty of gluten free New Forest discoveries to make. 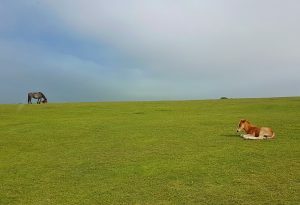 We stayed near Lymington, which was a great base from which to explore the New Forest itself, as well as the Eastern reaches of neighbouring Dorset. 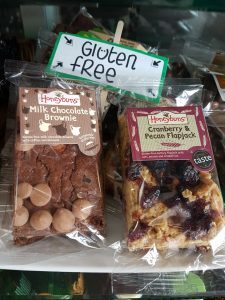 Our gluten free New Forest finds are listed below. You will find recommendations for Winsor, Fordingbridge, Lyndhurst, West Wellow and Brockenhurst. There are also suggestions for the surrounding area, including Lymington, Gordleton and Totton. 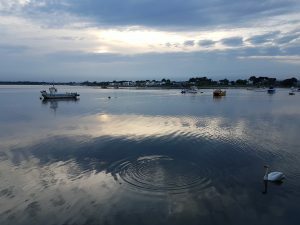 Plus, I have included a section for East Dorset as it is very close by – we visited Mudeford, Christchurch and Hengistbury Head. 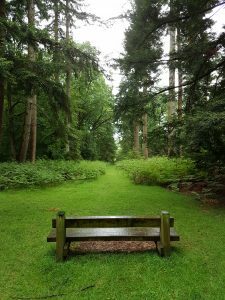 There are lots of gluten free New Forest pub and afternoon tea options scattered around the area, perfect for combining with a morning or afternoon of walking the forest’s leafy trails. 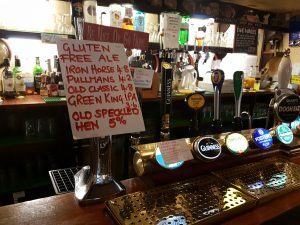 The Compass Inn – a 100% gluten free New Forest pub. You read that right. I was amazed with this place, which was recommended to me by the lovely staff at Tea Total. The entire menu is gluten free and they also have a good number of dairy free options (including mega puddings). 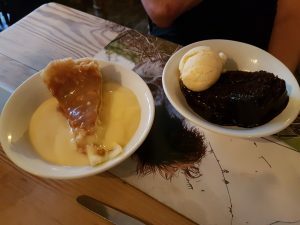 Imagine all the pub favourites you ever had when you were younger and you will find the gluten free equivalents here: pies, fish and chips sponge puddings, crumbles, garlic bread, it was brilliant. They also offer a gluten free afternoon tea and have a number of gluten free beers available. The Foresters Arms – a peaceful spot in a small village on the North West side of the New Forest. 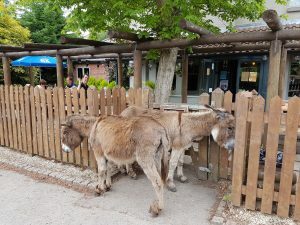 They have a big beer garden out back and table out front (so you can admire the herd of donkeys…11 showed up while we were eating out meal!). Their menu has the gluten free options marked on it. Plus they have a separate fryer that is kept gluten free for the chips (vs the other fryer which is used for gluteny scampi etc). Lots of great pub classics available and a fab addition to our gluten free New Forest portfolio. 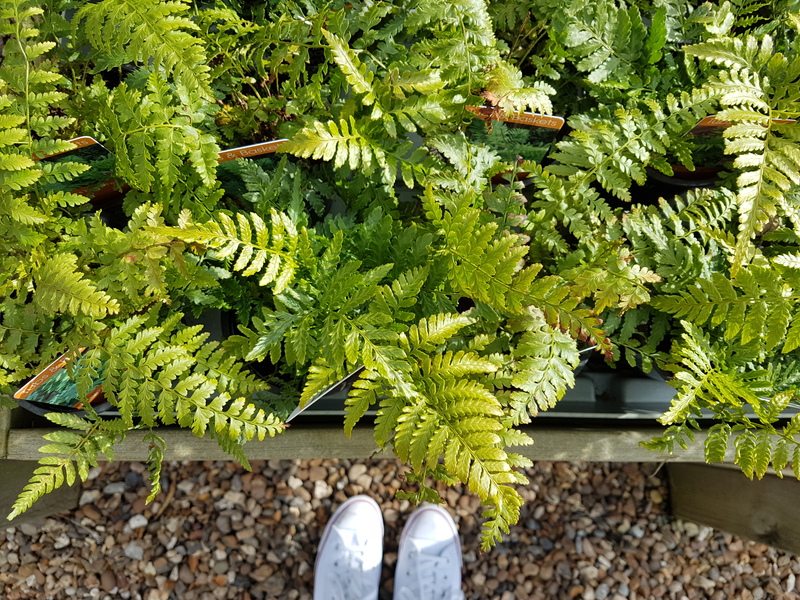 Tea Total – we stumbled across this absolute gem of a tearoom in the middle of the New Forest in Lyndhurst. 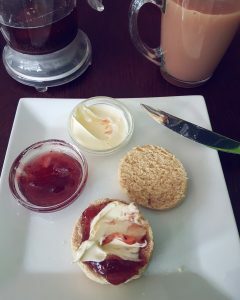 They have an entire dedicated gluten free menu with gluten free cream teas, crumpets, sandwiches, panninis, cakes, etc. Use of separate toasters and tongs help to avoid cross-contamination and one of the owners is gluten free. The cafe has a number of lactose free and dairy free options too. Highly recommended and my top pick for a gluten free New Forest cream tea. Mad Hatters – closed when we visited, but there was a big sign in the window advertising gluten free scones. It looked like a veritable Alice In Wonderland-themed extravaganza in there! 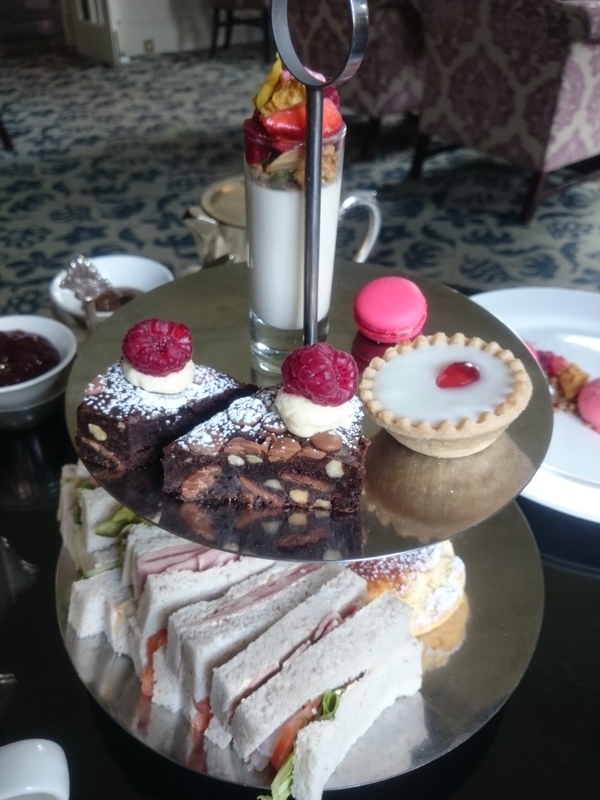 The Lime Wood – this very grand hotel near Lyndhurst is able to offer a number of gluten free options on their restaurant menus, including for afternoon tea. Angela Harnett’s excellent restaurant can be found here plus the hotel also have some brilliant culinary pop ups with top cooks visiting at different times of the year, such as Skye Gyngell and River Cottage chefs. Have a look on their website to see if you can catch one of these dates. The Forage Deli & Eatery – a sweet little cafe in Lyndhurst with occasional gluten free options, including cakes. 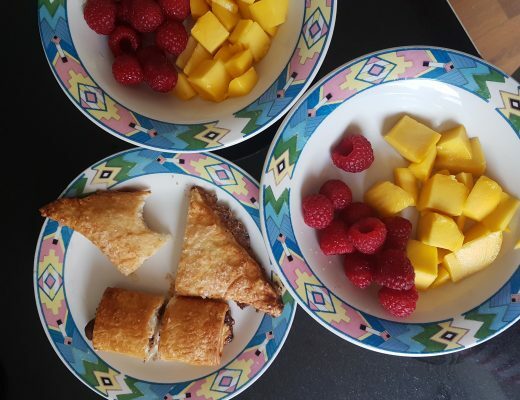 The Lyndhurst Teahouse – we didn’t get a chance to visit, but I saw from the sign in their window that they offer a number of gluten free options, from gluten free scones and cream teas to gluten free cakes and sandwiches. Peggy May’s Cafe – another spot offering gluten free scones in Lyndhurst. Forest Glade Ice Cream – I was too full after my scones at Tea Total to try one but they have gluten free ice cream cones here! Enzee – an Italian restaurant that offers gluten free pasta as an option. 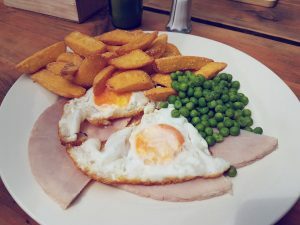 The Rockingham Arms – to visit on our next trip, this pub in West Wellow has a dedicated gluten free menu available featuring all sorts of goodies and plenty of choice. The Pig Hotel – recommended as a treat meal place that caters ablely for coeliacs. Rosie Lea Tea House & Bakery – recommended for gluten free cream teas in Brockenhurst with scones and cakes available. 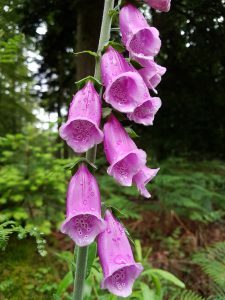 The local Coeliac UK gluten free New Forest group recommends Rhinefield House Hotel for gluten free cream teas, cakes and sandwiches. The Larder – a nice little spot tucked away just off the high street in a courtyard, with some outside seating, When we visited they had gluten free bread (so the sandwiches and tartines could be made gluten free), gluten free porridge and gluten free cakes. 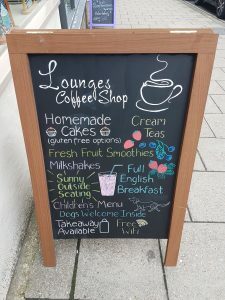 Lounges Coffee Shop – a coffee shop on the high street with gluten free options. They also had baked potatoes with gluten free toppings and gluten free cakes. Ciao Belli – not tried and tested, but recommended to me for their excellent gluten free pasta. Koh Thai Tapas – I spotted that this Thai restaurant has all the allergens marked on their menu and they had various dishes that were gluten free or could be adapted to be gluten free. Cook – if you have self catering accomodation you should pop into Cook to pick up some no gourmet ready meals and puddings. They have a few gluten free options and do a meaaan gluten free brownie. 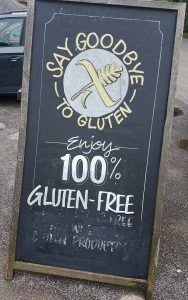 There are also some chain restaurants in Lymington, such as Pizza Express and Prezzo, which offer safe gluten free options for coeliacs and are accredited by Coeliac UK. 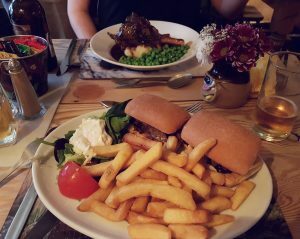 The Mill – this pub had a dedicated gluten free menu and a lot of the dishes on the main menu are also marked as being gluten free. Fuchi Chinese – has a gluten free menu and is good for coeliacs, a reader tells me. You can find the menu online and it looks brilliant – from lobster with ginger and spring onions to sizzling squid in black bean sauce and stone hot pot beef rice. 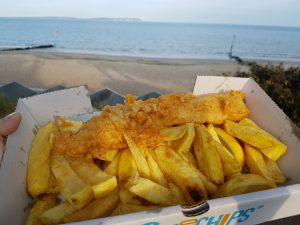 If you are staying south of the forest in Lymington, East Dorset is only a short 20 minute drive away and there are some fantastic gluten free finds there, along with lovely beaches and walks. The Jetty – what a brilliant experience. 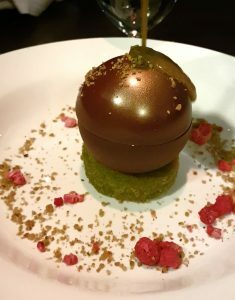 Tempura prawns, twice baked cheese souffle, whole lemon sole with beuure blanc sauce, chocolate sphere filled with rasberry, chocolate ganache and pistachio icecream on a pistachio sponge. They use gluten free flour in their kitchen hence the brilliant array of gf dishes and their fryers are gluten free so no worries about an cross-contamination there. They also produced gluten free bread for me and staff had brilliant knowledge. Quite a fancy spot with views across the harbour, check your gladrags on and treat yourself. 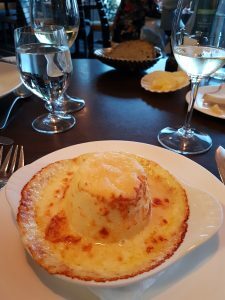 The Noisy Lobster – I noticed that the menu for this restaurant had GF and DF marked and that there were a few gluten free options on both the breakfast and dinner menus. Right on the seafront, this would be a lovely spot to dine. 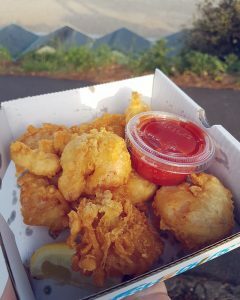 Brown’s Fish & Chips – omg the BEST scampi (gluten free scampi or otherwise) I have ever had. 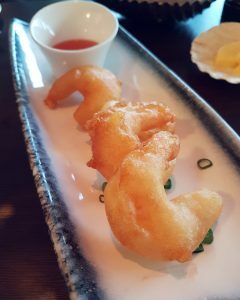 The prawns were massive and succulent and the gluten free batter was light and crispy. Seriously good. 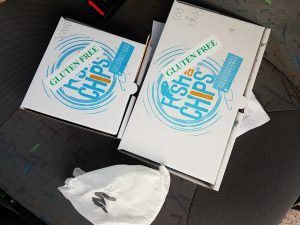 They have loads of gluten free choices here and have separate fryers for the gluten free items and follow advice set by Coeliac UK re cross-contamination. A lovely lovely area for walking, from the car park out to Mudeford Sandbank. 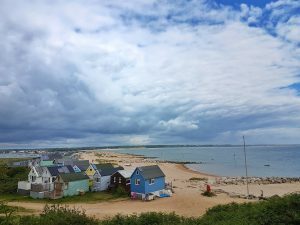 If you walk up onto Hengistbury Head you will be rewarded with brilliant views across the harbour and Avon beach. Hiker Cafe – the cafe in the car park sells a selection of wrapped gluten free cakes. They had Honeybuns when we visited. Their dine in menu is also marked up with GF and they offer baked potatoes with various toppings, plus a couple of gluten free salads. 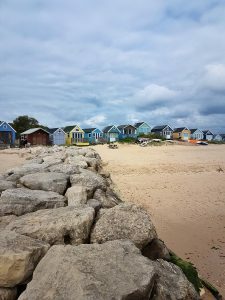 Beach House Cafe – down on Mudeford Sandbank is this little cafe, which had a couple of gluten free options when we visited (quinoa salad and some lighter seafood dishes) so might be worth checking out for lunch although I would not rely on it. The little shop next to the cafe had a few gluten free snacks on sale. Frieda’s Afternoon Tea Bus – we didn’t take the trip ourselves, but I have read about this bus (which offers gluten free afternoon tea option). 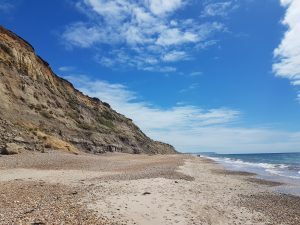 It loops to Bournemouth from Hengistbury Head – could be a perfect little outing, especially if the weather isn’t good.